Florida experiences various growing conditions, with a tropical climate in the south and a humid, subtropical climate in the northern and central portions of the state. If you live in Florida, select plants according to bloom time, flower color, general culture and intended use. Many plant varieties grow well in Florida's winter weather. Winter jasmine (Jasminum polyanthum), sometimes called pink jasmine, belongs to the olive family (Oleaceae) and likes moist soils in partially to fully sunny locations. This twining vine reaches up to 20 feet and bears glossy, green leaves that keep their color throughout the year. Fragrant, white blossoms emerge from pink buds in late winter. While native to Southeast China, Florida gardeners can typically train winter jasmine to climb arbors, trellises and fences. 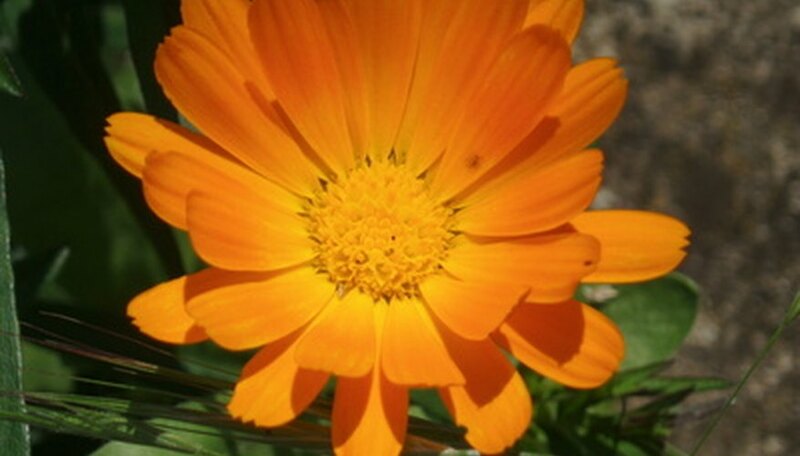 Calendula plants (Calendula officinalis), also called English marigolds and pot marigolds, range from 12 to 30 inches in height with similar spreads. This European native plant bears vibrant, green leaves and thick, hardy stems. Yellow, orange or cream-colored flowers bloom during Florida's cool winter weather. This daisy family member (Asteraceae) prefers moist soils in partly to fully sunny locations. Gardeners often plant calendula in containers, borders or flowerbeds. The firespike shrub (Odontonema strictum), also known as the scarlet flame and the cardinal guard, belongs to the Acanthaceae plant family and naturally occurs in Central American forests. This evergreen plant reaches up to 6 feet in height and bears glossy, deep green leaves. The vibrant crimson flowers bloom from summer through winter. Firespike shrubs like well-drained, moist soils in partly shady to fully sunny positions. Established plants tolerate drought conditions. Florida gardeners generally use firespike shrubs in hummingbird gardens, shrub borders and butterfly gardens. Florida greeneyes (Berlandiera subacaulis), sometimes referred to as common greeneyes, belong to the Asteraceae plant family and naturally grow in Florida landscapes. Mature plants reach from 12 to 36 inches in height and like dry soils that receive plenty of sunlight. Large flower heads bloom year-round, featuring small, yellow or red flowers. Florida greeneyes work well planted in sunny borders, perennial flowerbeds or butterfly gardens. The scarlet calamint (Clinopodium coccineum) belongs to the mint family (Lamiaceae) and goes by many other names, including scarlet wild basil, the red mint shrub, red savory and scarlet balm. This small, shrubby plant reaches up to 3 feet in height and bears stiff stems and slightly aromatic, green leaves. Flowers bloom throughout the year, featuring bright red petals with deep red spots. This native Florida plant prefers sandy, acidic soils in partial to full sun. The scarlet calamint performs well when planted along sandy flatwoods and on sandy hills. The beach sunflower (Helianthus debilis), sometimes called the cucumber-leafed sunflower, ranges from 18 to 48 inches in height. Native to Florida's coastal regions, this perennial bears heart-shaped, green leaves and hairy, green stems. Flowers display year-round, featuring bright yellow petals that surround red-brown to red-purple central disks. This Asteraceae family member likes sandy soils in full sun positions. Established plants tolerate some drought conditions. Florida gardeners often mass plant beach sunflowers as ground covers, borders and dune stabilizers.